Jim Henry has cracked the case of the mystery rider from 1948. The latest issue of the Friends of Speedway quarterly magazine is out now. "I thought Mark could have been as good as Gary Havelock if he had stuck to it. I used to love watching him at Cleveland Park when he first started out. Mark, Steve Wilcock and Martin Dixon were 3 of the best heat leaders I have seen ride together in 47 yearrs watching speedway." John Hyam on the interesting career of Dave Collins. Dave appeared in British, South African and Spanish racing. 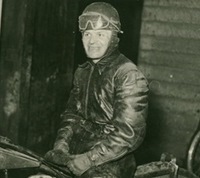 Bill Hamilton has been trying for many years to identify the rider in this photograph from 1948. Can you put a name to him? "Sorry, but can't see the significant tie up between board racing and speedway. Board racing,to my mind, is a pure speed event focussed on straight line speed. It was probably a very good way for bike manufacturers to showcase the speed and reliability of their machines. Board tracks, saucer tracks and even the banked concrete tracks like those at Aston Villa and Celtic Park of the (pre war UK) are interesting in themselves but not, in my opinion, in a speedway .context. I find references to events staged at trotting tracks, with their loose surfaces, mostly sand, much more interesting and think these are more significant in the pioneering days for speedway. The motor cycle magazines of the pre-war (W W 1) do gives these events a bit coverage and the odd photos often appear to show a shower of material being thrown up by the back wheels. would love to hear of any of events like this you come across in your researches Brian. Despite my comments re board tracks, do keep up the good original research work." "SIM is a great community and a wonderful game - from 10 mins a week to a few hours, it appeals to everyone - I have been around for nearly 10 years now and I would say to anyone, give it a go."